Spring may have just begun, but it is still pretty cold here in DC. There are buds on the trees but it is still chilly in the morning. Since we are still in between season, we need an in between soup. Something that is hearty, but not a thick puree. This kale and white bean soup is exactly what is called for. 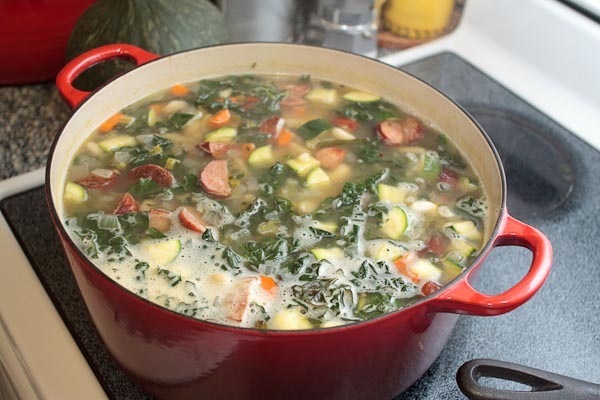 The broth is light and the kale is green, but the sausage and beans help keep you warm. This recipe doesn’t call for it, but I threw in some zucchini I had lying around… feel free to innovate. I also went with Andouille sausage instead of kielbasa. â€¢Soup is best if made 1 or 2 days ahead. Cool completely, uncovered, then chill, covered. Thin with water if necessary. â€¢Lacinato is available at farm stands, specialty produce markets, and natural foods stores. Be aware that it has many aliases: Tuscan kale, black cabbage, cavolo nero, dinosaur kale, and flat black cabbage. Ths soup is perfect for these inbetween days. Yes, this is exactly the season spanning soup I’ve been making for the past few weeks. The weather is cool enough here in New England that we still need hearty soups, but we no longer need heavy soups. White beans and kale are an irresistible combination.